What do you know about the Legacy of Sleepy Beauty and Maleficent? We all know of the connection between Aurora and Maleficent, our classic protagonist and antagonist. Did you ever wonder how Disney came up with the concept for Maleficent? It was such a different yet acceptable explanation for Maleficent’s character that it made me curious. Luckily, I was able to dig into the mind of Executive Producer Don Hahn and get some answers for all of us. Don put it in such a feminist's way that I loved his explanation. The story of Maleficent was that “love comes in all sorts of packages, all shapes and sizes and even from someone who on the outside can be evil.” He didn’t like the old classics where it seemed as though they were saying, “ladies, you can’t do anything with your life until love comes along. “ Isn’t that nice? Maleficent is a film that has caught up with our times, equality and feminism. Feminism doesn’t mean female power or dominance; rather it is a stand for female equality. It signifies the shift in Disney as well, who acknowledge and embrace that society has changed and the old fashioned story of the 50’s didn’t quite make sense anymore. Angelina Jolie really embodies this concept in her role as Maleficent. She is strong, powerful, and elegant even during her evil days. Don Hahn applauded Angelina in her role, she “brought fashion and script advice” besides her fantastic acting skills. Even when she’s playing an evil character, you can’t help but see the little glimpses of love that peak through when she takes care of Aurora as a baby and then as a young lady, all in the background. At the same time, Maleficent still preserves some qualities from the original Sleeping Beauty. The production crew looked at the original paintings and artwork for inspiration. They even kept some of the lines to prevent too much of a deviation from the original. I agree with Don that it provided more impact and the lines just kind of worked into the film naturally. 1) Maleficent is a creation of Walt Disney that wasn’t in the original fairy tale. Walt worked with Marc Davis who came up with Maleficent. 2) Angelina wore fake cheek bones to make her look more like Maleficent. 3) On the last day of filming, Angelina flew straight off to Lebanon for her UN ambassador trip. 4) The original story had 12 good fairies and 1 bad fairy. Walt got the story and changed it to 3 good fairies and Maleficent. 5) Maleficent was originally designed with bat wings and scalloped edges. 6) At the time Walt was creating Maleficent, he was also building Disneyland and working on a separate movie. 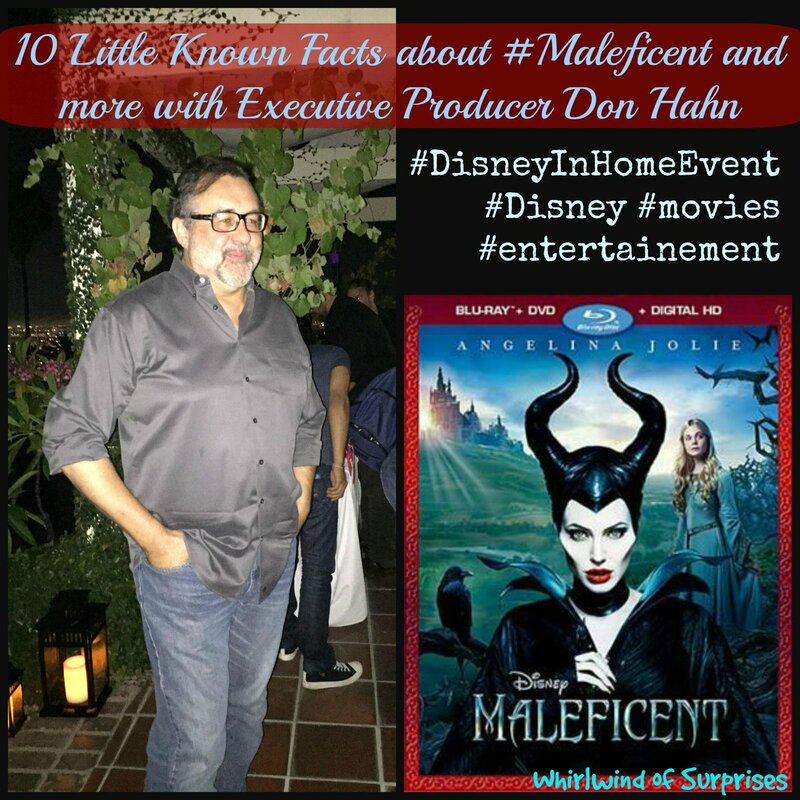 7) Don Hahn was most surprised about the power of cutting off Maleficent’s wings and how getting them back had such an impact on the audience. 8) Did you notice a lack of a mother character? There was a reason to that. If Disney had kept a motherly character around, there’d be a benevolent force and a tough emotional connection for Aurora when she came back to the castle. This made it so that she really only had Maleficent to go back to. 9) Disney purposely made the fairies “more jokey and fun” per Don Hahn so that they could let Maleficent expand her role as a maternal character. 10) Little known fact about Maleficent: There was a lot about 2nd chances in this film. The producers talked a lot about leaders like Churchill during the production phase. People can be heroes in one era and lose everything, then come back again heroes in another era. It served as a background to show how Maleficent wasn’t always bad and perhaps, she could become good again. Own the elegant Sleepy Beauty & Maleficent in your Disney collection today.